John W. MacDonald's Weblog: Eleanor Wachtel, C.M. Eleanor Wachtel, originally uploaded by johnwmacdonald. 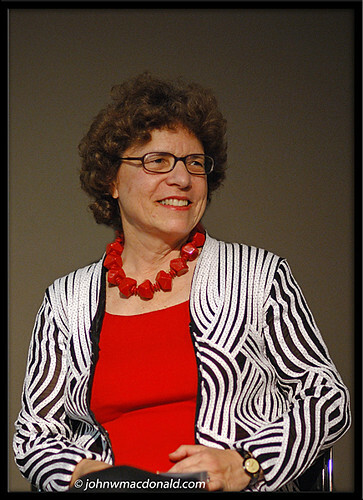 Eleanor Wachtel appeared at a pre-writers festival event to launch her book, "RANDOM ILLUMINATIONS: ELEANOR WACHTEL ON CAROL SHIELDS ". The event on 30 September 2007 was hosted by CPAC'S Ken Rockburn. Donate to World Literacy of Canada and have fun doing it! you will get a tax receipt for $100! feel great supporting World Literacy of Canada! Hey Anonymous, feel free to contact me directly regarding your PSAs. I don't really like plugging events via the comments.